I can safely stamp my confidence in the fact that a good 90% of you reading this have had either thought or said something along these lines. Boredom is no stranger to us. In fact, it probably visits us so often that it’s close to being an almost lover. What is boredom? It’s an emotional condition that we experience when we’re left with nothing to do and not interested in our surroundings. … and not interested in our surroundings. Would it be wrong to say that boredom is a choice that we make? Maybe we choose to not be interested in anything else besides the same old methods we use to pass our time. Maybe we choose to stay in our rooms staring at our computer screens all day. Maybe we stop ourselves from trying new things and going to new places. If that’s the case, are we bored? Or are we just boring? It’s the 21st century. We’re living our lives in the hustle and bustle of a city, a city that’s blooming with different arrays of restaurant cultures and new forms of entertainment every other month. We’re living in a time where our phones, laptops and tablets are more than just an extension of our body but have ultimately become an extension of our ability to feel. The Internet links us to everything we want to know and gives us access to everything we want to be a part of. It’s hard to believe that this technology equipped concrete jungle we call our home offers us nothing to do. There are a lot of us who don’t want to find the time to explore the possibilities our city has in store for us. Instead, they opt to stick by the routines they’re accustomed to, sometimes feeling satisfied and other times feeling rather indifferent. This isn’t enough to answer the good old “do only boring people get bored?” question with a “YES”. To me, there are two ways to look at it. First of all, nobody would like to call themselves boring – and nobody should. I believe that no one is boring. There is no such thing as a human that’s uninteresting. We’re all different from each other, each with different features, different styles and different minds. We have so much hidden from each other and so much to learn from each other. It’s impossible to have nothing that’s worth the interest of others. The term ‘boring people’ is something that I don’t agree on and I hope society views it in the same light as I do. Secondly, the concept of fun is just like beauty. It’s meaning lies in the eye of the beholder. An adrenaline junkie looks at a computer geek and doesn’t get how the complexity of a computer game could match up to the idea of hiking up a mountain. On the other hand, a computer geek doesn’t understand how hiking up a mountain could even be deemed more fun than his computer game. Both individuals enjoy their time doing what they love. They’re having fun. What one person views as boring could be another’s idea of having a blast. However, it is important that we stop ourselves from being tuned to one frequency all the time. The idea of a ‘boring person’ is perceived as a person that never likes to try anything new. Avoiding unfamiliarity isn’t always a good thing. Climb a mountain. Have a go at scuba diving. Pick a book and read it even if you haven’t read a book in years. Play those board games you used to play when you were a kid. Have those late nights. Sing your lungs out at karaoke booths. Meet your friend’s friends. Try that drink you’ve had your eye on. Experiment. Do things you haven’t done in ages, and do things you’ve never done before. Only boring people get bored? I don’t think so. People in general get bored, regardless of whether you’re the most eccentric of individuals or the most reserved. It’s not a matter of what you’re labeled as; it’s a matter of how you view your own life and how far you want to expand those views. So how about we quit complaining and start living a little? Tags: boredom, choice, food for thought. Bookmark the permalink. Well said! 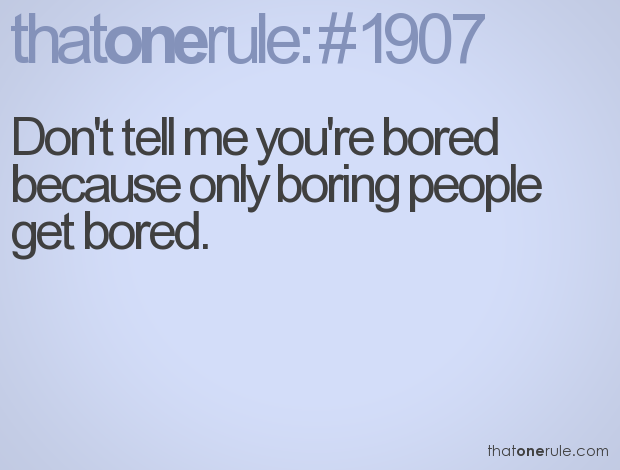 I must agree, people who say they are bored are really boring people!